The other day, as the film version of Slaughterhouse Five was playing on television, I realized that there is something inherently human and timeless to all of Vonnegut’s work. Cat’s Cradle, The Sirens of Titan and Slaughterhouse Five are all stories that still make perfect sense. "People err", "love thy neighbour" and “Why are we here?” are all powerful topics worthy of inquiry. And so it is with Jailbird, a touching look at the follies of capitalism and life in general. Walter Starbuck is a minor criminal implicated in the Watergate scandal and Jailbird is the story of his first day out of prison. Of course, this is Vonnegut, and as Vonnegut always demanded, there is a an autobiographical prologue, references to familiar characters from his other works and a semi-linear structure. Kilgore Trout is once again introduced and quickly discarded, but this time he is the pen name of an inmate not a character per se. As with many of Vonnegut’s later novels, the ending to the story is versed in small scoops throughout the narrative so that it carries a sort of heft and inevitability. 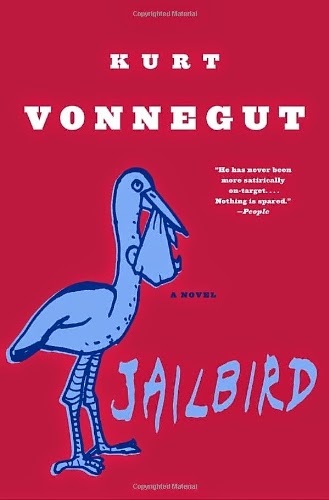 It is a beautifully crafted piece of literature and I kept wondering, how Cat’s Cradle and Slaughterhouse Five typically receive most of the praise, when Jailbird is genuinely this good. No matter, the two aforementioned novels aren’t bad either and, in fact, I look forward to rereading the whole bunch in just a few weeks. All in all, there is a lot to love about Jailbird. It succeeds on so many levels that I feel like rereading it immediately. It is a story that comes full circle at the end and, for me at least, inspired some soul searching. Nothing serious, mind you, but it does come after your heart from so many angles that it is difficult not to feel a little moved.